William Arthur Blog: Personal Stationery | Contest! From books of letters, to countless articles, to gift-guides full of stylish stationery, it's evident that letter writing and personalized stationery are quite in fashion. It's such a delight to open a personal note from a friend or family member, and it's lovely to return the gesture. 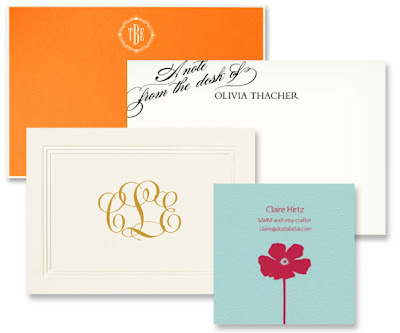 Stationery is a reflection of your very own personal style—the choice of typestyles, ink colors, motifs, monograms, and envelope linings—all combine to make stationery uniquely yours. Here is just a sampling of the full range of stationery styles we are offering to the contest winner. For more details about entering the contest, please read below! It's easy! Please subscribe to our blog via email by January 29th and you will be entered to win your own choice of personal stationery, valued up to $250. The winner will be selected on Monday, January 30th from a random drawing of new blog subscribers who have joined between Tuesday, January 24th and Sunday, January 29th. No purchase necessary. You live in the United States. The winner must reply to our email notification within 48-hours. Please note: The "Subscribe to Win" box is located at the top of the right-hand column.